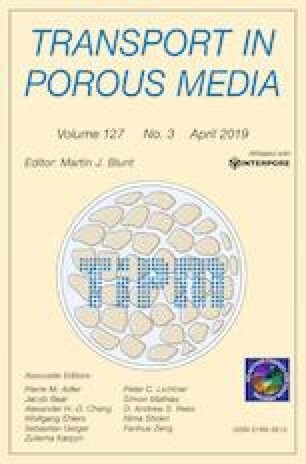 We present a general novel technique to monitor saturation changes on small rock samples of only 15 mm in diameter and 20 mm in length for the purpose of assessing the kinetics of spontaneous imbibition processes. With a fully 3D imbibition configuration involving countercurrent flows through all faces of the sample, the method is based on an NMR technique in which the sole oil phase present within the sample is monitored. The experimental method is fast for two reasons that are (1) the possibility to perform accurate measurements on tiny samples and (2) the adoption of a 3D flow geometry. The kinetics of oil desaturation during spontaneous imbibition is analyzed with the help of an analytical 3D diffusion model, according to which the kinetics is proportional to the value of a “capillary” diffusion coefficient. For the purpose of demonstrating our methodology, we used this technique to compare the spontaneous imbibition of restored sandstone miniplugs from a sandstone reservoir, with and without alkali in the imbibing brine. The imbibition kinetics was quantified as capillary diffusion coefficient values. The studied case results revealed mixed impacts of alkali on the spontaneous imbibition kinetics, involving both a brine–oil interfacial tension change and a wettability alteration of the rock, the latter requiring further investigation beyond the scope of this article. We thank OMV for allowing us to publish the results. Wolfgang Hujer is also acknowledged for providing laboratory data and rock description.